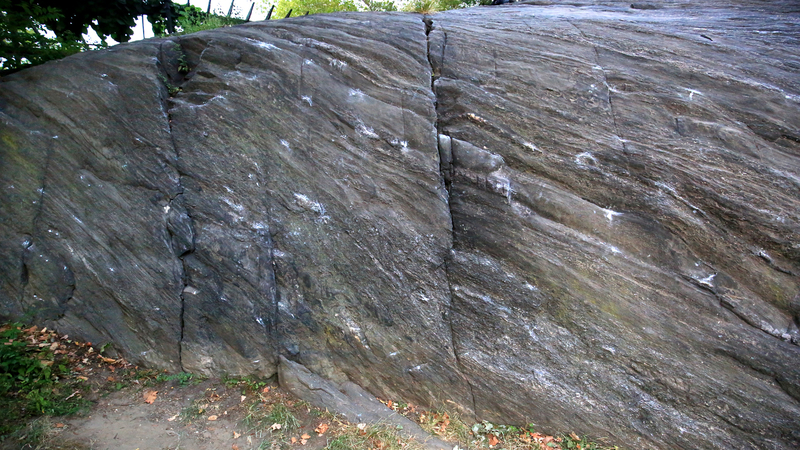 Chess Rock is found adjacent to and just below the Chess & Checkers House in the south area of Central Park. It is a low, rounded boulder to the east of Rat Rock and to the west of Cat Rock. Access: From Cat Rock or the Trump Rink, walk west. Within a hundred feet or so, look for the low, rounded boulder to the north that faces west. Exposed to the sun all afternoon, it's recommended to climb in the morning or evening during the summer months. 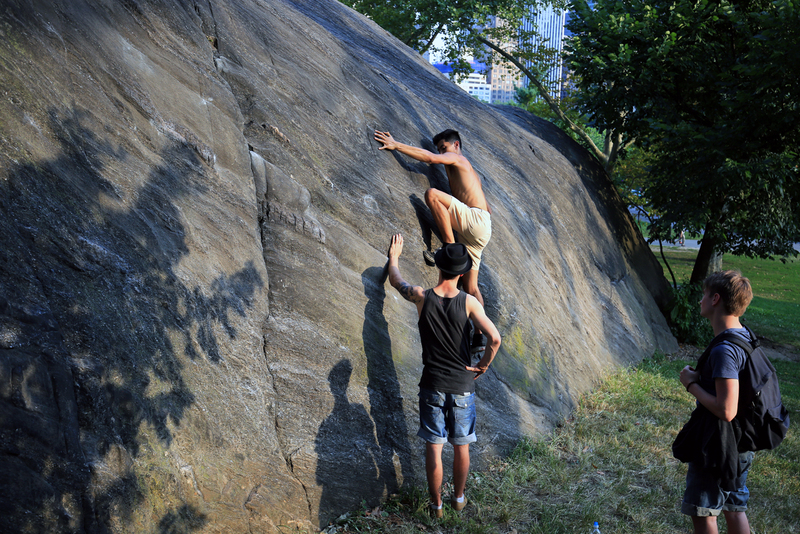 While often dismissed as a boulder for beginners, Chess Rock offers some of the best thin face climbing in the city. While certainly not as steep and extreme as the problems on the middle face of Cat Rock, the better and steeper problems at Chess require balance, creative footwork and a bit of grit when it comes to topping out. 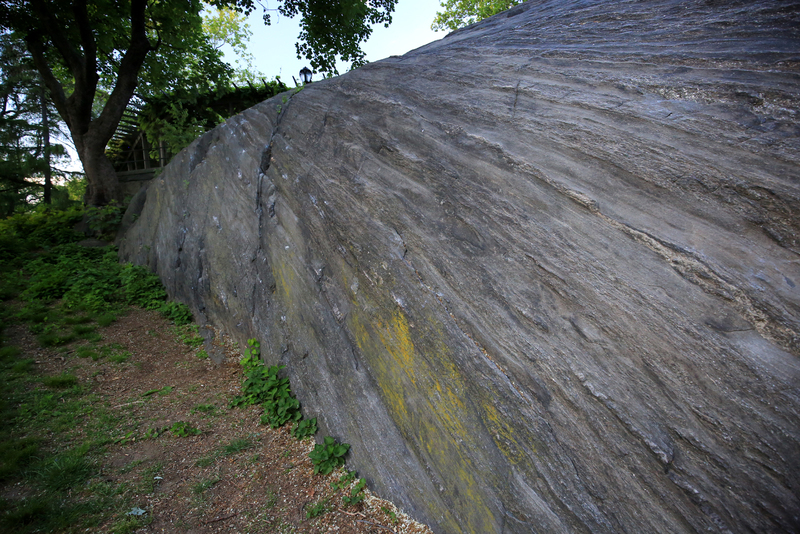 The name of the boulder is not only apt because of its location, but also due to the nature of the climbing found here. 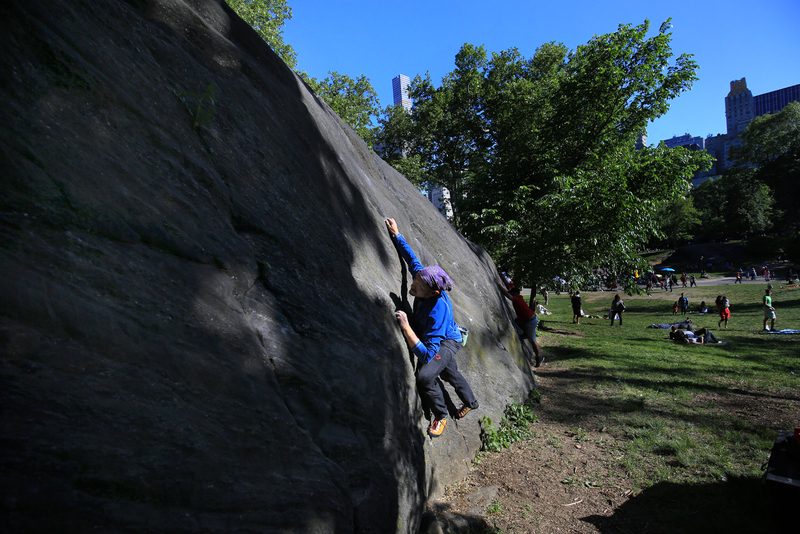 While the problems here are easier and the grades are lower than what you'll find elsewhere in the park, the traverse and the vertical climbs at Chess require a thoughtful, puzzle-solving approach. While the original edition of this guide did not bother to specify the vertical problems (mostly due to how short they are) the better ones have gained increased popularity and are now described here. Start: On either end of the boulder. Go: Left or right, traversing high or low using the many edges and sloping holds. Start: At the featured vertical "crack" just north of the halfway point. 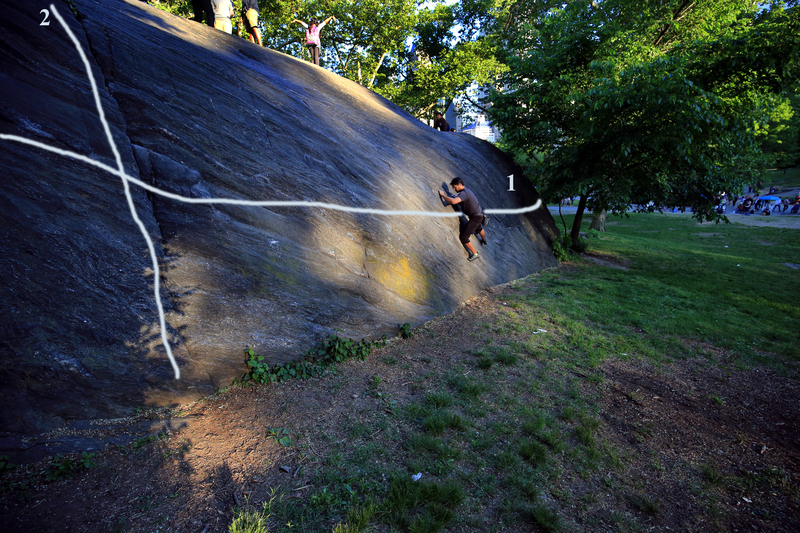 The only pure crack line in the city, Checkers is climbable without using any face holds on either side. Enjoy the finger locks! 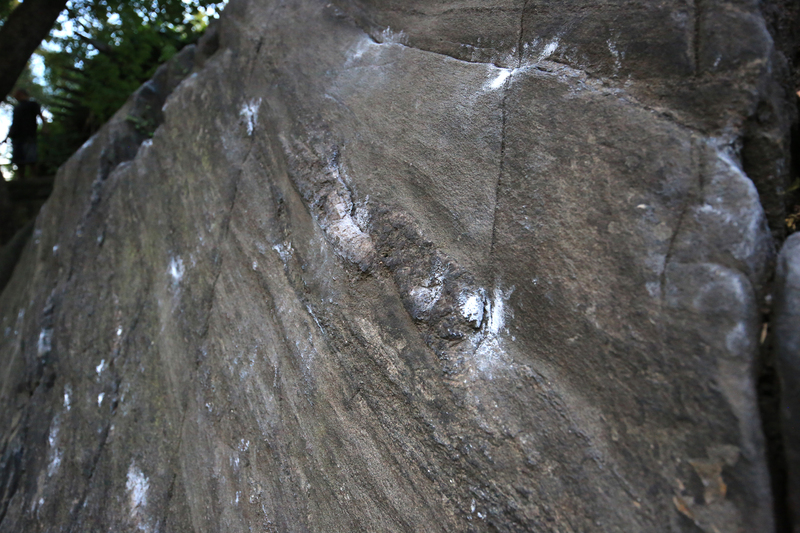 Start: Just left of Pawn Crack at a dark insipient seam. Go: Step up and move left to gain good diagonal hand rail. Make the crux move and exit left. Variation 2: Blitz Move VB (5.9) Start immediately left of Pawn Crack, using a right-hand side-pull just off the crack. Move up and slightly left to gain a big hold in black rock, joining Your Move at the top. 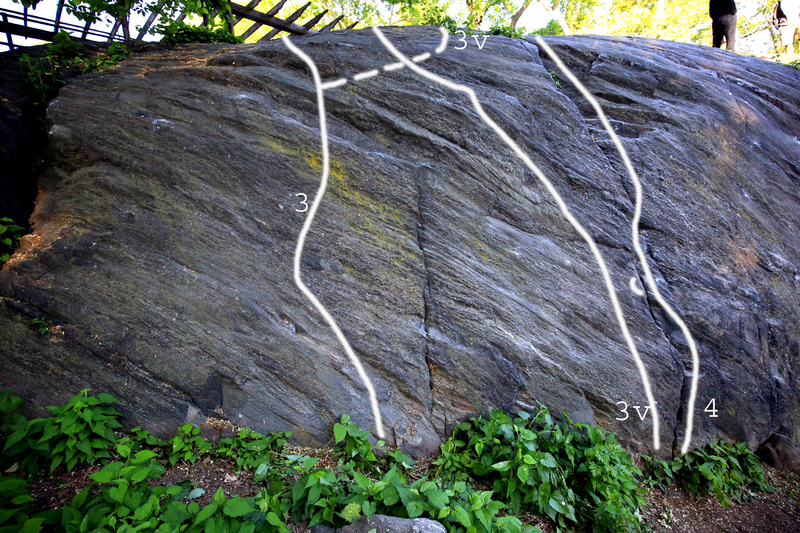 Start: At the leftmost crack line, up the hill and under the tree near the Chess and Checkers House. Go: Up the crack using whatever holds you find as you go. Start: At two broken insipient crack seams between Pawn Crack and Checkers. Go: Using an assortment of crystal holds and edges, work your way up the face until you can reach the crystal dike above that offers a large hold (as well as the smaller rail below it). Trend to the left as you exit. Start: Right of Checkers and right of Knight's Challenge at the small scoop near the left side of some obvious yellow lichen. Looking up, you'll see another obvious incipient seam a little to the left. Go: Step up into the scoop. Work your way up over the bulge, finding smaller and thinner holds as you climb toward a hard-to-see flake/edge. Getting to the flake/edge is the crux. Hang in there until you can get your feet set and you can reach some better holds. Top out on the upper slabby part of the face. 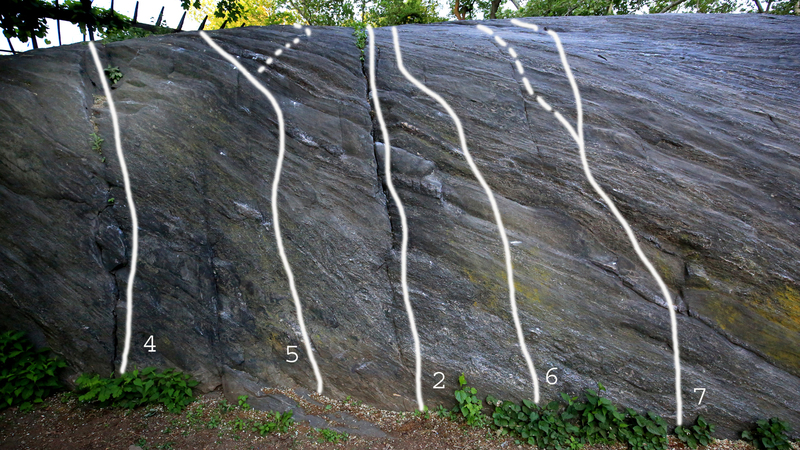 Variation 1: Sans Voir V3 As you work your way over the small bulge in the face, instead of angling slightly right toward the crux flake edge, trend left toward the incipient crack above that offers some small holds. Continue up the incipient crack (crux) until you finally come across some better holds and top out. Variation 2: Kriegspiel V4/5 Combines a sit-start with variation 1 for an intense, super thin face problem. Find a comfortable spot to sit-start amid the yellow lichen, right of the small scoop. Follow the diagonal flake line left until you join the original Rooked start at the scoop. Then up to the incipient seam on the left and finish on Sans Voir. *High quality problem and variations, but be prepared to lose some skin if you session here too long. *The landing is good, relatively flat, but it's recommended to have a pad or spotter or both given the nature of the crux and finishing moves. *Not steep and not high. Yet the top-outs are a little cheek-clenching. 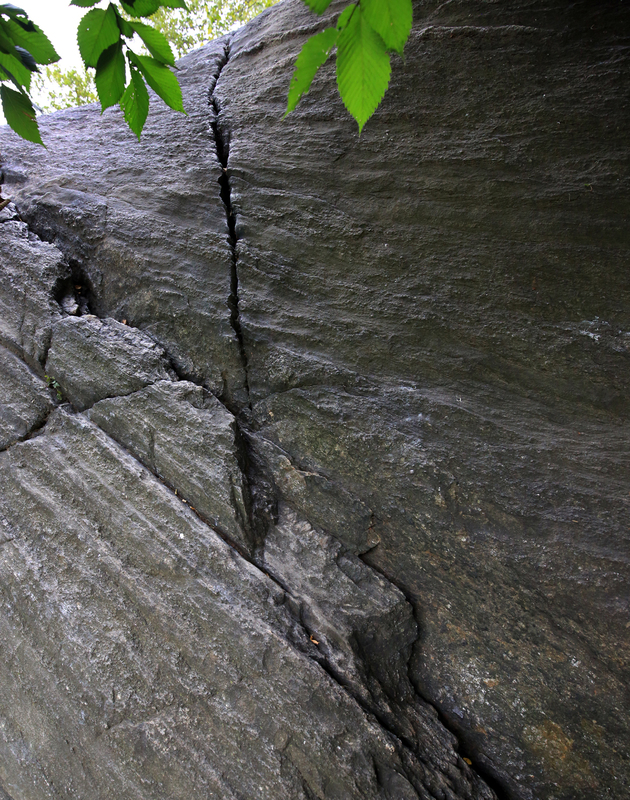 North half of Chess Rock features two cracks and several high quality face problems. Start: At the far south end of the boulder, under the shade of a tree, atop a blocky flake ramp. Go: Up over the blocky flakes and into the splitter crack that splits a low-angle slab. 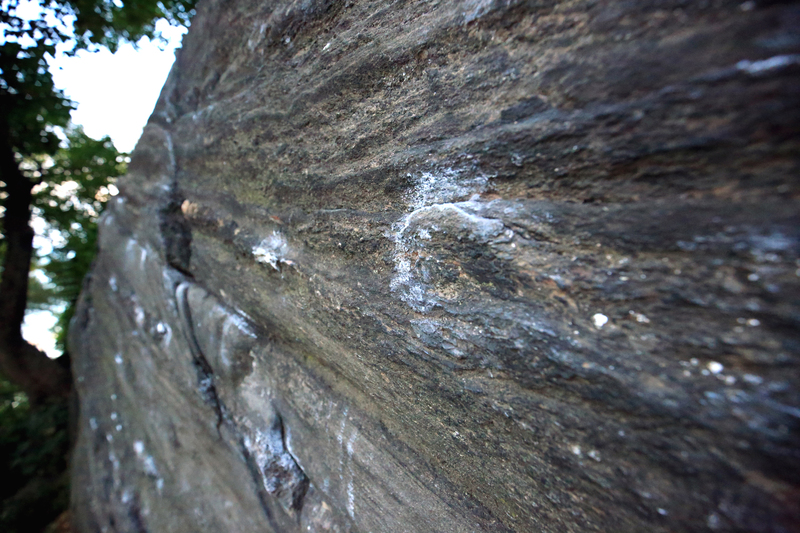 *A rare, clean vertical crack that should have been 10 feet longer and several degrees steeper. Visiting climbers take a run at ROOKED V2. Small, but sharp edge on beginning of KNIGHT'S CHALLENGE. Assortment of holds found at the crux of THE BISHOP. 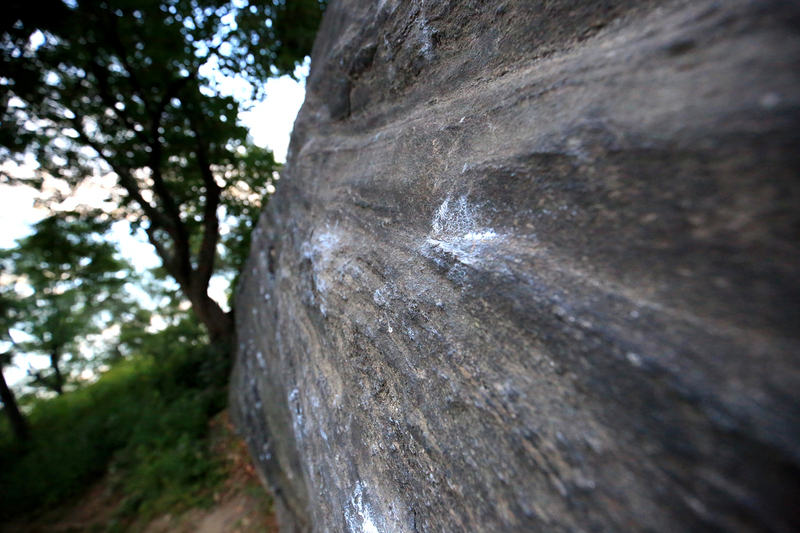 One of the key micro slopers that begins the thin moves on the crux of ROOKED.